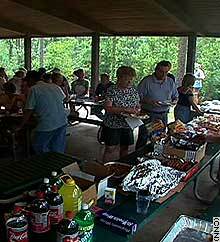 Residents of Greenville, Alabama, organized a Labor Day picnic for Katrina evacuees. GREENVILLE, Alabama (CNN) -- The people of this small Alabama town have opened their homes and hearts to survivors of Hurricane Katrina. Several evacuees said the welcome has been so generous and so genuine, that they've decided to relocate here. Carolyn Anderson and her family say they lost everything in Bay St. Louis, Mississippi. "We ended up here in Greenville and it's the best place we've ever been. They've treated us like family. We have not needed for anything. It's like we came home," she said. Her family, including her husband, son, and mother, have already found a place to live, and she's accepted a job offer to teach special education. Greenville's Department of Human Resources is the first stop for evacuees who make it to this town of about 7,000, between Montgomery and Mobile. There they meet with a Red Cross representative, and begin the complex process of applying for long- term help. In the meantime, the people of Butler County have stepped up to the plate to keep them safe and comfortable. A local warehouse is packed with everything from clothes and shoes to pet food and toiletries. Several volunteers are taking evacuees' soiled clothes, washing them and returning them to the hotels, or local residents' spare bedrooms, sheltering those who have lost their own homes. The still-dazed newcomers also are offered phone cards, medical care, cash to fill their gas tanks if they have cars. At a Labor Day picnic for the evacuees, Greenville City Council member Jeddo Bell said it's a community that has always looked out for its neighbors-- whether they have been around for 10 years or 10 minutes. "This is how we live from day to day, we live very closely and we work together and that's what it's all about, that's what makes it tick, that's what makes it stick," said Bell. In the first few days after the disaster city leaders realized they may be hosting hurricane victims, a town meeting helped create a simple scheme of "who does what." "We wanted to make sure our response was a timely response, we wanted to make sure it was effective and efficient," said Greenville Police Lt. Anthony Barganier. "We got the Chamber of Commerce, the local radio and newspaper people to put together packets of information, and made sure all the hotels and restaurants received these so they could be passed out," said Barganier. Many of the evacuees in this town say they try to stay strong and keep their emotions in check, especially if they have children. Katinia Fullard, who made her way out of Gulfport, Mississippi, says her 3-year-old daughter is scared and confused by the chaos of the storm and being in a strange new city. But the toddler has found new friends in a busy playroom at Greenville's Department of Human Resources. Volunteers as young as 12-year-old Nina Marie Gaffard are playing with the kids while the adults tackle paperwork. "So far in Greenville I've gotten a lot of hospitality," said Fullard. "I've never been to a town where people have been so nice and so giving, no matter your race or color. We weren't getting this in Gulfport," she said. Fullard also plans to resettle in Greenville. At the donation warehouse, James Cannova of Gautier, Mississippi looks through clothes. He had moved into his home just two days before the storm hit. He and his fiance and their dog made it out with a few possessions, as the water rose about 15 feet in 15 minutes. While he would like to return to the Mississippi coast, right now he says he's already frustrated dealing with his insurance claim. "You plan, you pay premiums, and now these companies are down there trying to figure out ways NOT to pay. 'Did your roof blow off before your house was hit by the waves?' Who the hell cares?" he said. While this influx of people has led to long hours for some city and county workers, so far there has not been a major strain on budgets or services. "Everybody wants to do something to help," said Frieda Stevens, who directs the Department of Human Services. And that's a lot easier to make happen in a small town, where neighbors talk to neighbors without consulting a flow chart. "It's wonderful because we don't have a lot of red tape," said Father Fred Rev. Fredrick Lindstrom, Jr., of St. Thomas Episcopal Church. "We just work together and make it happen," he said.